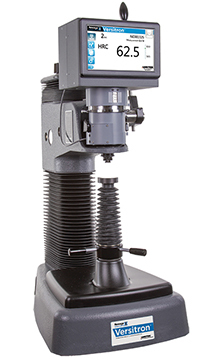 The Versitron Series is a unique hardness testing system which provides its users with the benefit of the top-loading and test surface referencing technology. Applying both the pre-load and full load in one test cycle makes it possible to perform a test in as little as 4 seconds! The removable clamping shield protects the diamond indenter from being struck by the specimen during handling and when test samples are clamped the indenter is protected from damage resulting from test samples shifting under load. The Versitron features test-surface referencing. Test surface referencing immediately surrounding the indenter is an indenter shroud. The purpose of the shroud is to sense the position of the indenter relative to the test surface when the preload has been applied. Should the test specimen deflect under major load, the shroud travels with the test surface to compensate by maintaining that precise reference position with the test surface, so the test result will remain accurate. The error resulting from deflection can be eliminated or substantially reduced as the test results are not sensitive to dirt. A hair under a test block will completely ruin most testers’ results but the Versitron remains accurate. And situated in good environments it requires less cleaning and maintenance. The Versitron hardness tester features a full color, icon driven display that facilitates easy intuitive navigation. Test results are shown in a large font size making them easy to read. The display is dirt and oil resistant and is easily cleaned. The BT130 interface is designed to last in even the harshest environments. With only a few buttons to push you are offered an easy access to histograms and statistical summary reports with an optional printer. The entire load system is modular and self-contained within the test head. The test head can easily be exchanged to measure different Rockwell scales. Versitron hardness testers can have different types of drive options from the standard level actuated drive, pneumatic drive or electric drive. Electric and pneumatic drives can be controlled with either a pushbutton or footswitch. Test results can be exported directly to DataView for further analysis or as a CSV file. The icon driven colour display and the tactile button interface makes this hardness tester easy to use while at the same time it is build to last for decades in even the harshest environments. Tests are performed in as little as 4 seconds, even on manually activated testers. Minimal operator training required. Accuracy is maintained. Errors due to vibration or dirty environments can be eliminated. Configure your testing system based on your needs today, but with the flexibility to update tomorrow. Select from multiple types of frames, drive mechanisms, indenters and accessories. Modular test heads can be easily removed, for example for calibration or for upgrading the embedded software with our latest features.